PORTLAND, Ore. – January 26, 2018 – Throughout February, USA Pears is celebrating American Heart Month with a variety of engaging promotions aimed at educating consumers that pears are a heart-healthy choice. The promotions will place an emphasis on the many nutritional benefits to be gained from making pears a regular part of the diet. With one medium-sized pear providing 6 grams of fiber (24% of daily recommended), as well as being a good source of vitamin C, pears make for a delicious and nutritious heart-healthy snack. Additionally, Anjou, Bartlett and Bosc pears are certified Heart-Healthy by the American Heart Association. 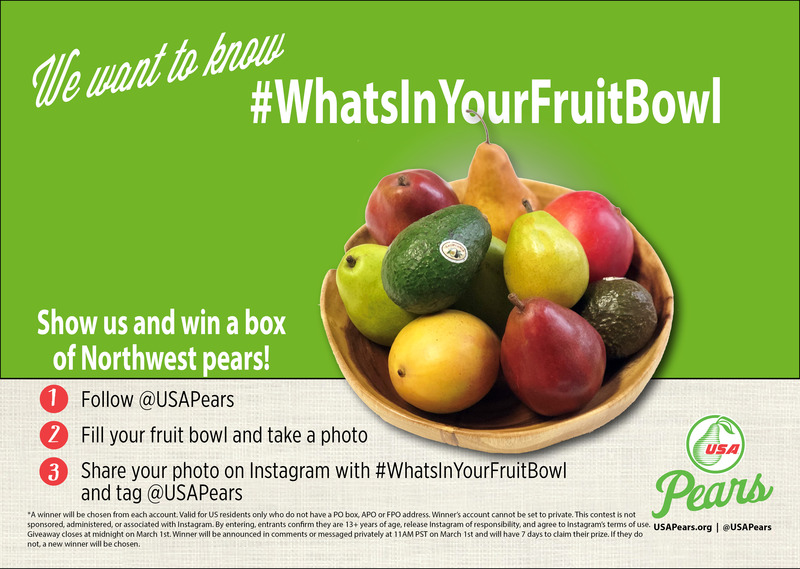 To encourage consumers to keep thinking about fresh fruit as a healthy staple, USA Pears is launching the #WhatsInYourFruitBowl social media contest. Running the month of February, the Instagram contest will encourage Instagram users to make a fruit bowl and snap a picture, sharing with the #WhatsInYourFruitBowl hashtag. USA Pears will award the winning entry a box of pears and a beautiful bowl to display them. 2018 marks the first time USA Pears will be running the #WhatsInYourFruitBowl contest and it is meant to remind households that healthy eating can start with something as simple and ubiquitous as a fruit bowl. Given the recent report from the Center for Disease Control (CDC), which states only 1 in 10 Americans get enough fruits and vegetables, the time is ripe to stock up on some produce. As a way of building additional fruit bowl awareness, the California Avocado Commission and the National Mango Board are incorporating #WhatsInYourFruitBowl into their social media plans for the month. To follow all the fun and ins-pear-ation or to join in, make sure to follow @USAPears on Instagram, Facebook and Twitter.